The exhibit runs now through July 6th at the SF Public Library. Before Flower Drum Song exploded on the Broadway stage and silver screen, a golden age of Chinese American nightclubs and performers flourished from the 1930s–1960s. Cabarets with names like Forbidden City, Kublai Khan, Chinese Skyroom, China Doll, and the New Shanghai Terrace Bowl were venues, mostly in San Francisco, where Chinese American singers and dancers could finally perform regularly in routines that had previously been considered white forms of entertainment. 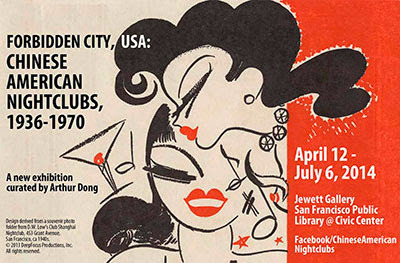 Forbidden City, U.S.A.: Chinese American Nightclubs, 1936-1970 is a ground-breaking exhibition that chronicles the history, legacy, glitz and glamour of this little known Chinese American story.